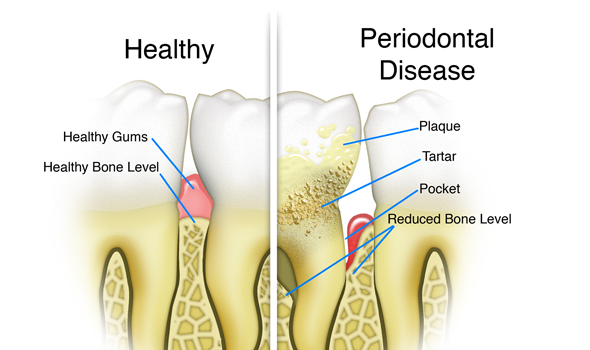 Gum Disease also referred to as periodontal disease is the condition when the bone around your teeth dissolves away. It is an infection where the tissues surrounding the teeth (gums ) become inflamed due to bacteria. The main cause of this condition is due to plaque which is a sticky, colourless film that forms on your teeth on daily basis. Plaque is composed of numerous strains of bacteria which stick to your teeth, roots and gums. These bacteria cause infection and lead to gums to become red, swollen and to bleed. Initially plaque can be easily removed by regular brushing twice a day and flossing. However if plaque remains on the teeth then it will harden into calculus or tartar for which you will need to get professional deep cleaning or periodontal treatment at a dental clinic. If untreated the bone loss will make tooth loose and eventually fall out. The bone loss could be irreversible, and so we target to prevent the bone loss before it’s too late to save your teeth. The initial stage Inflammation of the tissues surrounding the teeth (the gums) which become inflamed due to bacteria. Symptoms include swollen, red looking gums which tend to bleed on touching, brushing or flossing. If this is not treated swiftly then the gum can actually pull away from the tooth leaving pockets where plaque can be deposited and harden to calculus which can lead to further bleeding spontaneously, bad breath and a funny taste. Gums can also recede (shrink) exposing the root of the tooth which can result in sensitivity to hot and cold due to exposed dentine. Regular hygiene appointment to remove any calculus debris. This is the chronic form of gingivitis where the inflammation has progressed to bone loss resulting in pockets between the teeth and gums. The bone loss if extensive can make the tooth mobile, affecting chewing and speech. These loose teeth can start moving position. At this stage the goal is to stabilise the condition with periodontal treatment to prevent further progression to maintain the teeth for as long as possible. Deep cleaning – Special scaling instruments are used to clean the plaque and tartar that has built up on the tooth and underneath the gum line where the bacteria is on the roots of the tooth. This is known as scaling and root planing. The gum can then attempt to heal naturally and reattach to the tooth. Periowave – For most cases where scale and polish can’t treat the condition of the gums Periowave treatment is recommended and widely used. Periowave is a painless, quick, non antibiotic and effective procedure which can significantly improve treatment outcome when combined with scaling and root planing. 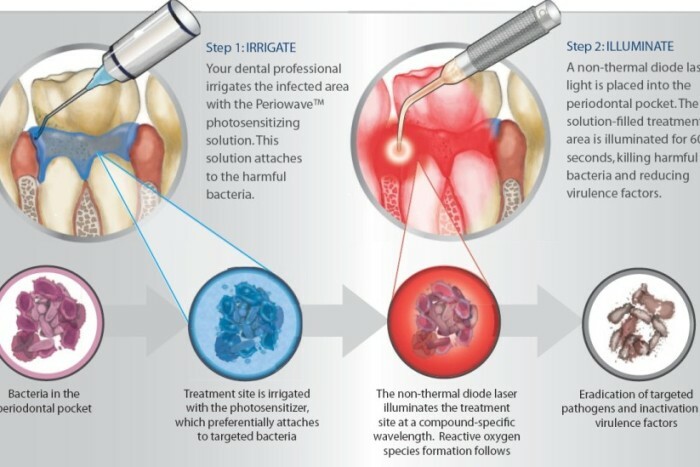 A non thermal laser which works to kill bacteria associated with periodontal disease. Its powerful photo disinfection reaction inactivate the harmful bacteria and toxins associated with periodontal disease that are left behind after deep cleaning. The gum then has the best ability to heal naturally and reattach to the tooth. The dentist will first perform a deep cleaning in the affected area or all of the mouth. A specially formulated photosynthesizing blue solution is then applied around the gums in the affected area. The blue solution preferentially attaches to the harmful bacteria and toxins which are remaining and are associated with periodontal disease. The Periowave non thermal, light diffusing tip is then inserted into each treatment site for 60 seconds destroying the harmful bacteria and toxins painlessly and without the use of antibiotics. Results are often immediate and include healthier less red looking gums, less bleeding and no more bad smell. The dentist will discuss your concerns and do a thorough examination of your gums. If required some X-rays may be taken of certain teeth to complete examination. The dentist will share the findings and provide a treatment plan along with answering any of your questions. Medical conditions : Certain health conditions like diabetes, heart disease, rheumatoid arthritis and kidney disease could make your gum disease worse. What will happen if I don’t seek any treatment? If you leave your teeth untreated then , the pockets may deepen and gradual bone loss will make tooth loose, more gum infection and eventually loss of teeth. What are the benefits of having periodontal treatment? After periodontal treatment your gums will become healthier, which will help you keep your teeth longer. Improvements will depend on how good you clean your teeth and the initial extent of your gum disease. If before the treatment your gums bleed or are swollen, this should improve. You may also notice your breath feeling much fresher. Most patients return back to work without any complaints. However, some might experience little teeth sensitivity while having cold food or drinks. What does aftercare for gum disease involve? Gum disease can reoccur so its important to note that you take care of your gums post treatment. Brush twice a day, floss and have routine hygiene appointment s at clinic to get check-ups and remove any bacterial deposits accumulated around your gums or teeth. How do I know my condition is getting worse? Normally first sign are bleeding gums , followed by loose teeth and then teeth drifting leading to gaps.. We recommend having regular routine check-ups with your dentist to pick any early signs.